Before this ruling, a one-point difference in IQ would make the difference between life and death for people on death row in Florida. An IQ score above 70 meant that a person was determined mentally sound—and the state could pursue the death penalty. A score below 69 meant that the person was disabled enough that execution was cruel and unusual punishment. As background, in the 2002 case of Atkins v. Virginia, the Court banned the death penalty for people with mental disabilities, reasoning that, because people developmental disabilities often act impulsively and without considering the consequences, it would be “cruel and unusual punishment” to put them to death. In that ruling, the court noted that an IQ score below 70 was a common sign (though not solely determinative) of intellectual disability. Ever since then, Florida, Virginia, Kentucky and Alabama had laws that determined intellectual disability based solely on IQ score. Anyone who scored a 70 or higher was determined to not have had an intellectual disability. Five other states — Arizona, Delaware, Kansas, North Carolina and Washington — appear to use a “bright-line cutoff” based on an IQ test. Thanks to yesterday’s opinion, this ‘line’ is no longer relevant—each person needs to be viewed and understood holistically, as a whole, not as a number. Yesterday’s ruling was a powerful step in the right direction. The ruling challenges us as a nation to consider the negative consequences of applying the sentence of death to any of our citizens. Who are we to say who lives and who dies? Who sets the arbitrary rules, lines, and cutoffs? Is there really a way to look at an entire person, to understand their history, and what brought them to the day they committed the crime? Is there a way to quantify remorse, or the ability to pursue a second chance? We believe there is not—and that because we cannot look at the individual holistically, because we are human, not god-like creatures, we should not be making these decisions. 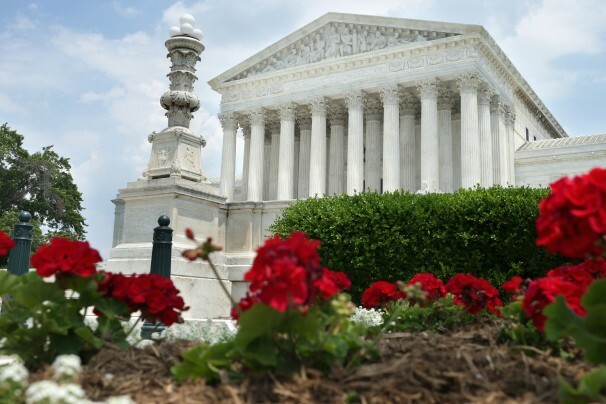 In the last decade, several states have reversed their use of capital punishment: Connecticut, Illinois, Maryland, New Jersey and New Mexico abolished it and New York’s death penalty was struck down by a state court in 2004. Following the shocking execution in Oklahoma last month, President Obama has directed the attorney general, Eric Holder, to review the death penalty, We welcome the intensifying debate on this cruel practice and are hopeful that this practice will be one we soon look back on as a country, wondering how we ever believed we were capable of deciding who died and who lived—who was deserving of a second chance. Support the Fair Sentencing Act SB1010! Today we encourage you to support the Fair Sentencing Act SB 1010! SB 1010 would signal the end of the unfair and unjust differences in penalties for possessing for sale of crack and powder cocaine. The Senate is voting next week – please tell your State Senator to vote YES on SB 1010. Take action today! As a society, we all bear the costs of disproportionately heavy and skewed sentences. Crack and powder cocaine are two forms of the same drug: gram for gram, there is less active drug in crack cocaine than powder cocaine. There is no justifiable reason for the difference in crack and powder cocaine sentencing, and this disparity only serves to enforce racial discrimination, segregation, and the creation of “The New Jim Crow” in our prisons. According to the CA Department of Corrections and Rehabilitation (CDCR), 98% of people entering a California prison for the possession for sale of crack cocaine are people of color. From 2005 to 2010, Blacks accounted for 77.4% of state prison commitments for possession for sale of crack cocaine (but only 6.6% of the state population), Latinos accounted for 18.1%, “Other” for 2.7%, and Whites for 1.8%. SB 1010 is an opportunity for us all to right this wrong—to stand for equality and justice. We urge you to click here for the ACLU of Northern California’s website and email or call your state Senator—TELL THEM TO VOTE YES ON SB 1010! Root & Rebound’s First Publication! 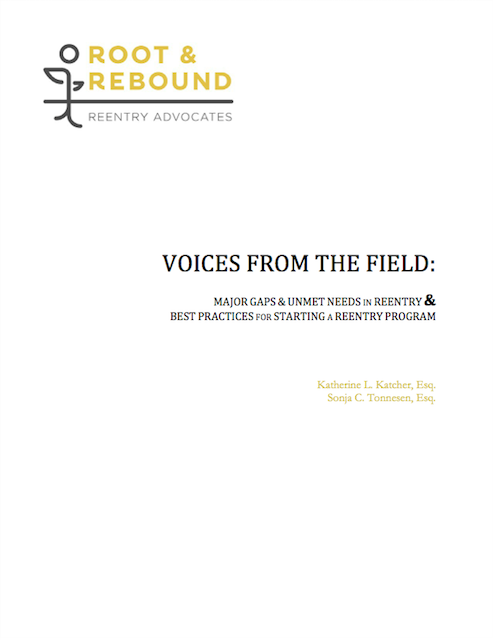 Today, Root & Rebound is proud to share its first publication, Voices From the Field: Major Gaps & Unmet Needs in Reentry & Best Practices for Starting a Reentry Program. This report is based on interviews conducted by Root & Rebound’s founding staff members about the current landscape of reentry. Over 70 practitioners in the field of reentry were interviewed for this project–including attorneys, social workers, formerly incarcerated advocates, educators, and academics–working in the Bay Area and Los Angeles, CA and in New York City. This report is intended to summarize the key lessons from these interviews into two parts: (1) the unmet gaps & needs in reentry and (2) best practices for starting (or reworking) your reentry program. We hope that the report is inspiring and educational for all! CONTRA COSTA COUNTY DROPS JUVENILE RECORD SEALING FEE! In an important shift, Contra Costa County eliminated the $150 fee the county charged people to seal their juvenile records. Many counties across the state still have such a fee. In Contra Costa, now that the fee has been removed, every person, regardless of their income, can afford to file to seal their juvenile record, opening opportunities for them to move forward in their lives, like securing a stable job, getting permanent housing, acquiring a professional license, and obtaining loans. As Stephanie Medley of Youth Justice Director at RYSE Youth Center in Richmond (RYSE), said, “Eliminating the fee creates accessibility and opportunity to a fresh start for young people.” Together with national organizing initiative All of Us or None, RYSE has advocated directly with the Contra Costa County Probation Department regarding elimination of the record-sealing fee since November 2013. The county’s fee removal is aligned with AB-1756, Assembly member Nancy Skinner’s “Starting Over Strong” bill. On March 25, 2014, the California Assembly’s Committee on Public Safety voted to pass the bill. It has now gone to the Standing Committee on Appropriations for further consideration. To be enacted, the bill must go through several readings and then pass a vote in the Assembly, and several more readings in the Senate as well as a vote. The Assembly would then again vote on any additional changes. Finally, both houses will vote on the amended bill and if successful, it will be sent to Governor Brown for his approval. If enacted, the bill will further increase access to the juvenile record sealing process for youth by eliminating the fee statewide—so that no Californian citizen will be unable to seal their record and restart their lives because of their economic status. To learn more about the statewide bill, click here to read a previous R&R blog post about it and click here to see the bill’s progress. What great news to end the week with! Today we are excited to share with you “The San Quentin Prison Report,” a radio series written and produced by a group of men serving time at the prison. With varied and thoughtful stories, it’s a great introduction to the challenges of navigating life in prison and on parole. Every story is told by the men themselves, in their own words and voices. The series inspires the listener to see beyond the labels of “criminal” and “prisoner” and “inmate” and to appreciate the men as individuals with valuable stories and insight to share, and as people with huge potential to contribute to our society. 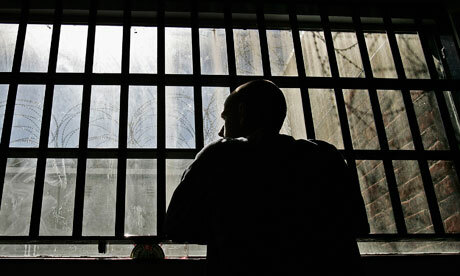 We’re excited about the SQ Prison Report program for a few reasons. First, the program gives participants at San Quentin valuable training in journalism, radio production, and public speaking. These are skills that will not only help the men to advocate for themselves after release, but will also be hugely useful when they begin seeking employment. More importantly though, the program provides an outlet for people serving time to tell their stories in their own voices, and offers listeners a way in to begin thinking about the broadcasters not as inmates or statistics, but as journalists, baseball players, medical assistants—human beings just like us with stories to tell. Last week’s report included a story about an all-star baseball game on San Quentin’s “field of dreams.” It included a profile of Sandy Rashid Lockhard, one of seven “gold coats” who spends his time at San Quentin assisting men with disabilities. Finally, it included a first person account of what it’s like to live with AIDS behind prison walls. 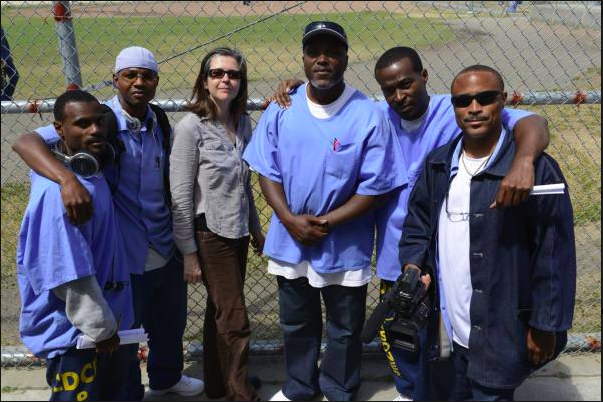 The San Quentin Prison Report airs on KALW (91.7 FM in the Bay Area) on occasional Mondays at 5:00PM. We encourage you to tune in, share with friends and family, and check out past reports online here! Victory! Alameda Superior Court Judge Orders Restoration of Voting Rights for Tens of Thousands Disenfranchised Californians. 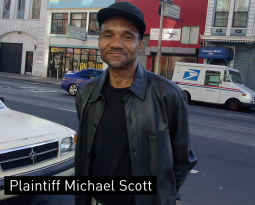 Michael Scott, one of the plaintiffs in the case, Michael Scott et al. v. Debra Bowen. Photo from the ACLU website. This week we blogged about an important case challenging the disenfranchisement of tens of thousands of voters in California. Today we have some exciting news regarding the case – an Alameda County Superior Court Judge ruled that Secretary of State Debra Bowen illegally stripped people on Post Release Community Supervision (PRCS) and Mandatory Supervision under California’s Criminal Justice Realignment Act of their voting rights two years ago, saying they are in fact eligible to vote. We at Root & Rebound applaud all the individuals and organizations that brought this lawsuit: the League of Women Voters of California, All of Us or None, The ACLU of California and the Lawyer’s Committee for Civil Rights. This is an amazing victory for returning citizens in the state. It is also an encouraging sign for all of us who work to protect the rights of people in reentry – as a state and a nation, we are moving in the right direction – away from legal barriers and exclusion – to upholding the worth, dignity and contributions of all of our citizens. See here and here for more details on the case. Today, we wanted to draw your attention to two upcoming restorative justice theater productions put on by the talented and inspiring team at Community Works. As an organization, they do some amazing work and we can’t wait to see the shows! This is the latest original production from Community Works’ ROOTS program, and based on the courageous and clear voices of students from Balboa High School, impacted by incarceration. In the swirl of issues at play, including Racial profiling, Self-stereotyping, Addiction, Feelings of powerlessness, Poverty, Resentment, Getting Caught up in “The Game”, Keeping up Appearances, Absent fathers, Vicious cycles – what happens when we take a closer look between the lines? Price? $6.00 per person with group discounts available – Click here to purchase tickets! 2. 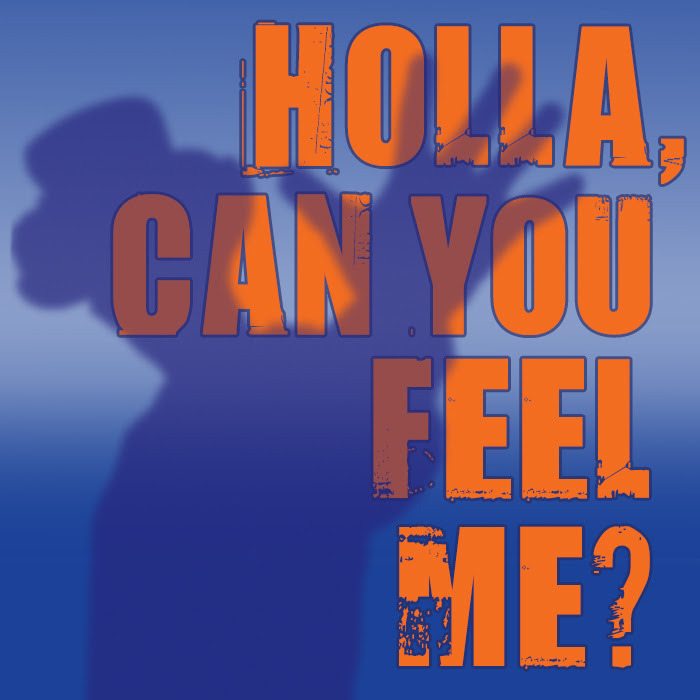 Holla, Can You Feel Me? 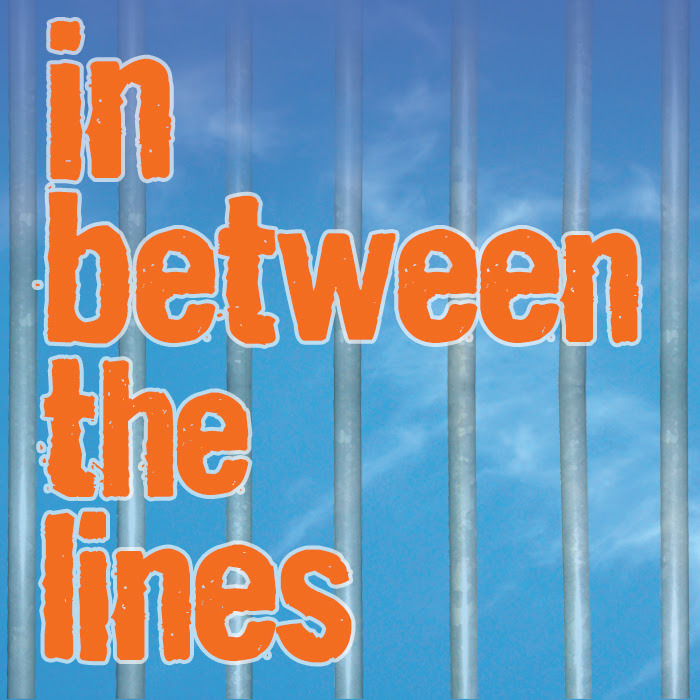 The play written by formerly incarcerated young men and women who wrestling with these difficult questions – Rising Voices and Voices on the Rise. How can formerly incarcerated men and women talk to each other about the difficult issues they are facing? The impact of past incarceration, the continual threat of violence and the constant fear of returning to jail are all challenges, that young people across the nation face everyday. On February 14, 2014, The ACLU of California and the Lawyers’ Committee for Civil Rights of the San Francisco Bay Area (LCCR) filed a lawsuit charging the state of California with unconstitutionally stripping tens of thousands of people of their right to vote. Since 1974, when California voters approved Proposition 10, state law has been clear that the only people ineligible to vote in California are those who are in state prison or on parole. However, in December of 2011, the secretary of state issued a directive to local elections officials asserting that people are ineligible to vote if they are on post-release community supervision or mandatory supervision. These two categories of supervision were created under California’s Criminal Justice Realignment Act for people recently incarcerated for low-level, non-violent, non-serious crimes. Are these really people that we want to strip the right to vote from? And who makes the decision to do so? The problem here was that this decision was made unilaterally by the secretary of state through a directive, without the input of millions of California voters. Since December 2011, more than 58,000 have been in local post-release programs according to Michael Risher at the ACLU – this decision will affect each and every one of them. This is something that all California voters should be up in arms about, “The law [in California] clearly establishes a presumption in favor of the right to vote, with only limited and specific exceptions,” said Meredith Desautels, staff attorney with the Lawyers’ Committee for Civil Rights of the San Francisco Bay Area. “The Secretary of State unilaterally expanded these exceptions, without any public comment or input, disenfranchising thousands of members of our community and creating confusion around the voting rights of formerly incarcerated people. This unconstitutional disenfranchisement particularly impacts communities of color, who are too often excluded from the democratic process. Executive Director of All of Us or None, Dorsey Nunn said, “Society is much more secure when all people feel they are fully part of it. If we want formerly incarcerated Californians to be good citizens, we need to convince them that they are a part of society too. I have never met a graffiti artist who spray paints his own home or business.” We agree: if the goal of the realignment law is to reintegrate people back into the community, then disenfranchising those individuals is not only unconstitutional, but goes against the spirit of realignment. We applaud the efforts of these groups and will be following this case closely on the blog. For those of you who want to read more about the case, a copy of the complaint is available here.